If you took a State of Alaska sponsored Hunter Education, Bowhunter Education, or Muzzleloader Education course and have lost your card, you can get a replacement card by sending us a letter or email. Your full name at the time you took the course. Where in Alaska you took the course. What course(s) you took and need replacement cards for (Hunter Ed, Bowhunter Ed, Muzzleloader Ed). A check for $5 (replacement fee) made out to “Alaska Department of Fish & Game”. Your current mailing address and phone number. Still have questions? 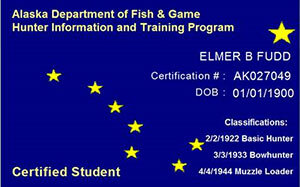 Call our Hunter Information and Training (HIT) Program office at 907-267-2187.